Michael Flynn, the former national-security adviser, said he is cooperating with Special Counsel Robert Mueller’s wide-ranging investigation after pleading guilty on Friday to making false statements to the FBI about his contacts with Russian Ambassador Sergey Kislyak. Flynn’s statement came after he entered a guilty plea in a Washington federal courthouse to one charge of lying to federal investigators earlier this year. 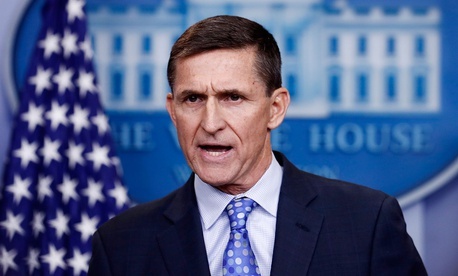 “On or about January 24, 2017, defendant Michael T. Flynn did willfully and knowingly make materially false, fictitious, and fraudulent statements and representations in a matter within the jurisdiction of the executive branch of the Government of the United States,” a federal court filing by the special counsel’s office said. Mueller’s office announced Friday morning that Flynn had misled investigators about these conversations in two ways. First, he told the FBI that he did not ask Kislyak on December 29, 2016 “to refrain from escalating the situation in response to sanctions that the United States had imposed against Russia that same day.” That conversation took place on the same day that the Obama administration announced sanctions against Russian President Vladimir Putin’s government for interfering in the 2016 presidential election. U.S. intelligence officials reportedly overheard the conversation as part of their regular surveillance of Kislyak. When reports of the conversation became public in January, Vice President Mike Pence and then-White House Chief of Staff Reince Priebus publicly defended Flynn and denied any wrongdoing. Trump fired Flynn on February 14 for lying to both men about the nature of his communication with Kislyak. Friday’s filing also said Flynn misled FBI investigators about his efforts to persuade the Russian ambassador on December 22, 2016 to delay a vote on a then-pending United Nations Security Council resolution about Israeli settlements. In the formal statement of the offense filed Friday, the special counsel’s office laid out a timeline of Flynn’s conversations with Kislyak. After the Russian ambassador contacted him on December 28, 2016, Flynn called “a senior official of the Presidential Transition Team” at Trump’s Mar-a-Lago resort in Florida for advice on a potential response. “On that call, Flynn said the PTT official discussed the U.S. sanctions, including the potential impact of those sanctions on the incoming administration’s foreign policy goals,” the filing said “The PTT official and Flynn also discussed that the members of the Presidential Transition Team at Mar-a-Lago did not want Russia to escalate the situation.” The identity of the official with whom Flynn spoke is not disclosed. Flynn subsequently relayed those messages to the Russian ambassador and then notified the transition-team official of that conversation. Russian President Vladimir Putin announced his country would not retaliate against the Obama administration’s sanctions the following day. The filing also briefly describes a back-and-forth calls between Flynn and Kislyak about the United Nations resolution vote one week prior, as well as Flynn’s “other false statements” about his contacts and lobbying efforts on behalf of the Turkish government. Flynn’s legal issues may also extend beyond the question of Russian interference. Maryland Representative Elijah Cummings suggested in May that Flynn may have broken federal law by not disclosing his payments from Russia Today during a standard background check in 2016. Flynn is also under scrutiny for lobbying work he did on behalf of a Turkish businessman while also advising the Trump campaign. Those ties did not prevent the White House from trying to distance itself from Flynn after news of his guilty plea became public. Ty Cobb, a personal lawyer for President Trump, described Flynn in a statement on Friday as “a former National Security Advisor at the White House for 25 days during the Trump administration” and “a former Obama administration official,” downplaying Flynn’s close connection to Trump himself. For Flynn himself, the charges complete a rapid fall from political grace for the retired lieutenant general who served in both Democratic and Republican administrations. His two-year tenure leading the Defense Intelligence Agency under Barack Obama was a rocky one, eventually leading to his departure and retirement from the Army in 2014. He then entered the private sector and founded the Flynn Intel Group, a consulting-and-lobbying firm. Flynn joined the Trump campaign in February 2016 and soon became a trusted foreign-policy adviser and close political confidante of then-candidate Trump. Both men shared a mistrust of Obama’s counterterrorism policy and approach to confronting ISIS in Iraq and Syria. After Trump secured the Republican nomination, Flynn was among those reportedly being considered for the vice-presidential slot.